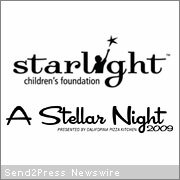 LOS ANGELES, Calif. /California Newswire/ — Starlight Children’s Foundation (starlight.org) will present Teri Hatcher with its 2009 “Heart of Gold Award” at the organization’s annual “A Stellar Night” gala, presented by California Pizza Kitchen, on Friday, March 27, 2009 at 7 p.m. at The Beverly Hilton Hotel. Starlight’s “Jacki Carlish Humanitarian of the Year Award” will be bestowed upon Nintendo of America and its President and COO, Reggie Fils-Aime. Starlight spokesperson Jamie Lee Curtis will present the awards, and Corbin Bleu and Chef Jeff Henderson will make a special appearance.